Kevin Hagley, then of Dark Peak FR, leading the pack up to Pen y Fan summit, with Corn Du screes in the background. Kevin, who may possibly lay claim to having raced Pen y Fan more times than anyone else (*analysis needed! ), is closely followed Don Ashton, who had already won the English V50 Champs just before that race and won the V50 category at Pen y Fan that day, leading to his British V50 title a few months later. Photo by Ken Price - on the cover of 1992 June/July issue of "Up and Running" magazine by Dave Woodhead. 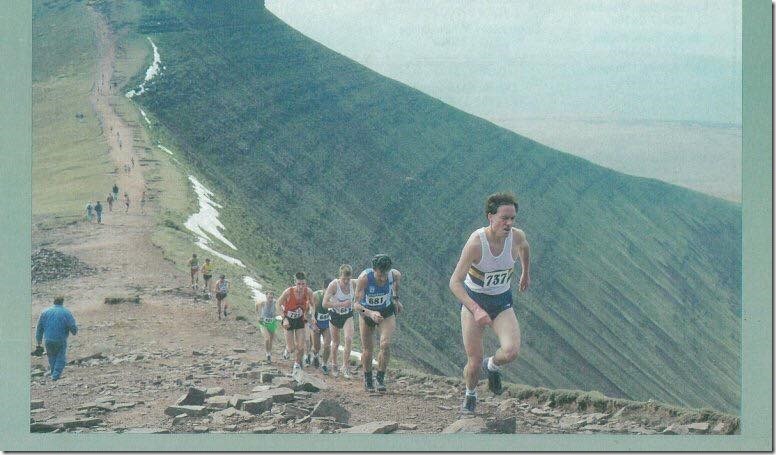 Kindly sent to me by Calvin Ferguson, Don Ashton’s grandson, who promises to race at Pen y Fan in 2019 (but fears he may not match his time!). Note the snow on the slopes, as the Pen y Fan Race was then held in March.